Kathleen Crook is a potter (30 years) and a jewelry-maker (just last year). When did you start making art? 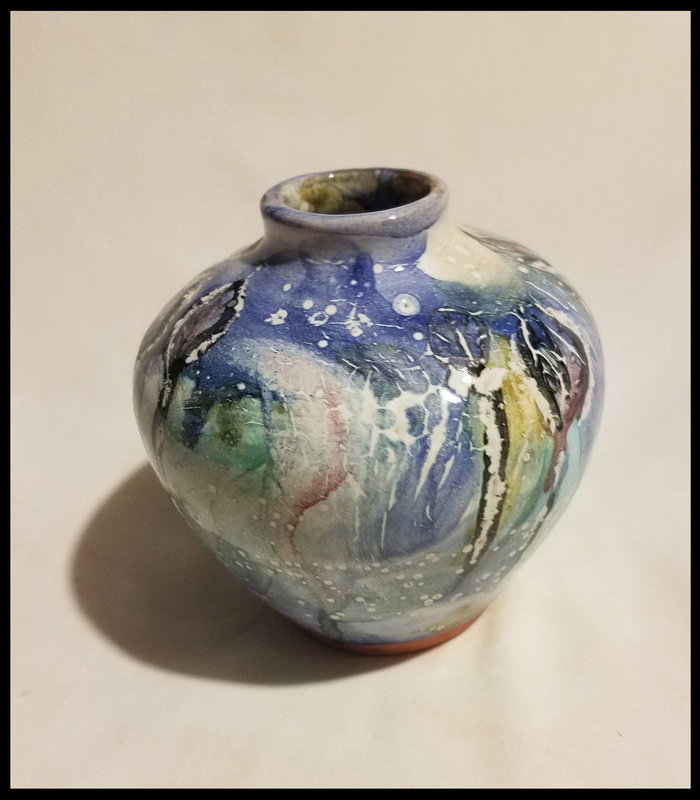 I started making pottery in college over 30 years ago. Making jewelry? I began making collage earrings a year ago, inspired by my husband who collects boxes and magazines. Who or What inspires you? My pottery influences are many. I am inspired by Warren McKenzie and his influence on Minnesota potters. I am not a McKenzie-influenced potter in my style, as I never studied with him. The Minnesota style (I call it this. It is a high fire stoneware functional pottery) is very popular here. What I do is not as popular, I think, because people are not used to seeing my style of work here. I think my work would be popular in Florida, California and tropical and Mediterranean locations. How do you select materials? I go to the clay store. Tell me about your favorite clay store. You know that clay stores are not like art stores. There is one that everyone uses and another that I can’t figure out how they stay in business. I will give them a shout out. I’ve been going to Continental Clay since 1982. (They were called Minnesota Clay then.) I am a very teeny little fish in the ocean of big time potters who use that place. It’s family owned. Third generation is working there now. If I get Mike on the phone when placing an order, he always asks who is calling and when I tell him, he genuinely remembers me and says it’s nice to hear from me. I bought my first wheel there and my kiln. Who is the customer you envision when you are making your work? Someone who wants to have a cheerful little piece of art to enjoy their food/drink in. Did you go to art school? Do you have art training? I have a BA from the University of North Dakota in Studio Art. It is not technically an art school. I also took one community ed oil painting class and sometimes I paint. Painting on canvas is quite challenging to me. What would you like your customers to know about you and your artistic processes. I began making low-fire pottery for the range of color it allows. Also, I fire a small electric kiln in my basement, which is suited to this type of firing. 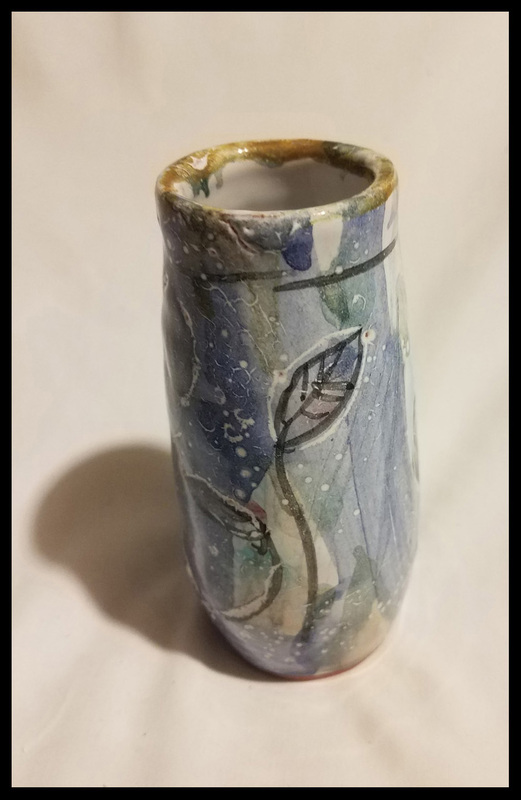 I am self-taught in a glazing technique called maiolica. This comes from Italy and the ceramics produced in factories that are intricate and colorful are maiolica glazed. I have travelled there and noted that the pottery produced on the Amalfi coast has a lot of folk art-like imagery. Personally, I have not pursued learning to master representational painting on pottery. Rather, my brush strokes and lines are fast and I look for something to have as a focal point (sometimes) then I add on lines and then take away glaze. My recent work that has a lot of a color of blue that I developed that is very rich. When I paint, it is sometimes very fast and some effects have come up that are very exciting to me. Some of the masters of maiolica would say there are flaws in my glazed pots, but these are textures that emerge from a free-flowing artistic process, which brings us all the way back centuries to the Japanese and Korean tea bowls where the hand of the potter can be seen in the imperfections. 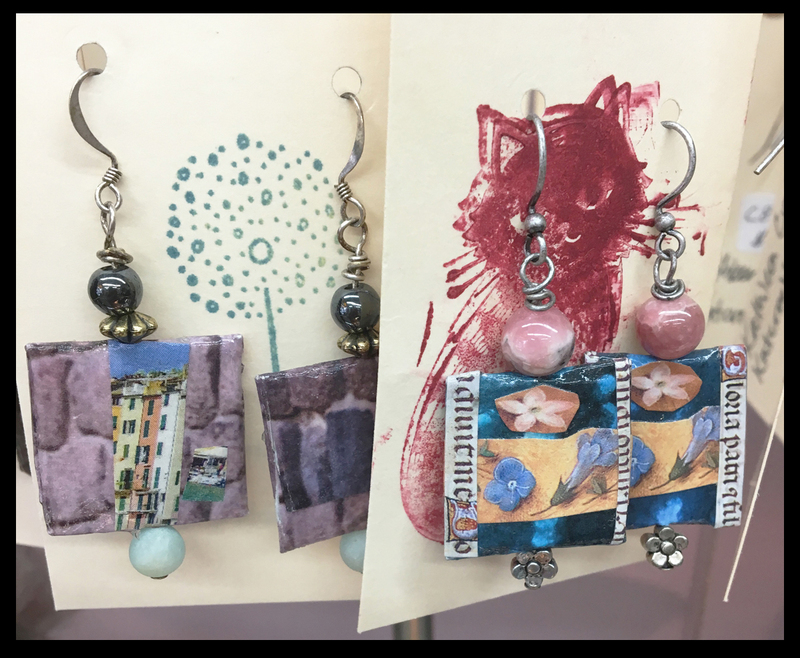 What inspired you to make collage earrings? After seeing an exhibit of a friend of mine who does a lot of collage art, my husband commented that he might be able to part with some of his enormous collection of magazines if he gave them to a collage artist. He also has a large collection of cardboard boxes. I have no idea where this light bulb idea came from but one day I was frustrated with no massage work and I decided to try to make earrings out of the cardboard boxes and magazines. I went out to bead Hive and bought a bunch of stuff hardly knowing what the hell I was doing. She is a member of the Vine Arts Center and she is a Certified Massage Therapist. The Art Shoppe at Midtown Global Market has six owners and nearly 100 Minnesota artist consignors. Every piece is made in Minnesota by a Minnesota artist. We celebrate Monday (every Monday) with 10% off everything in the Shoppe. Most Art Shoppe artists accept commissions.